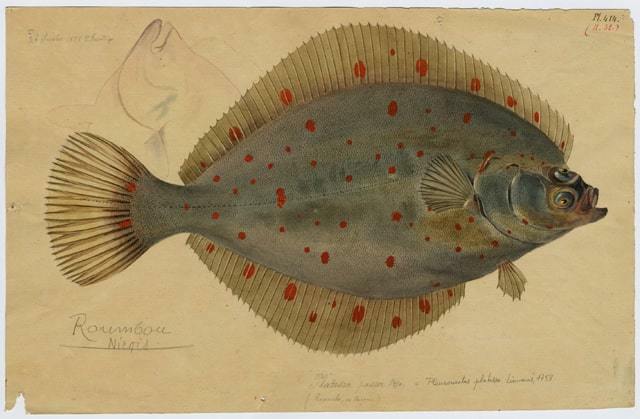 Superb picture of a plaice from Muséum d'Histoire Naturelle de Nice. Plaice is a very popular fish in northern Europe, especially in Holland, Belgium, Denmark, Norway and the UK, which border its main fishing area in the North Sea. It’s also found in much smaller quantities in the neighbouring seas – the Baltic, the English Channel and the Irish Sea as well as around Iceland, but is not present anywhere else in the world. It’s a flat fish, meaning that it spends most of its time on the sea bed. Its underneath side is white and its topside is brown with orange spots. Lying flat on the sea bed, it is well camouflaged. Plaice can live for 40 or more years and grow to a metre in length at which the weight would be five kilos or more. However the typical weight of a commercially caught plaice is around 400 grams, which is too small. 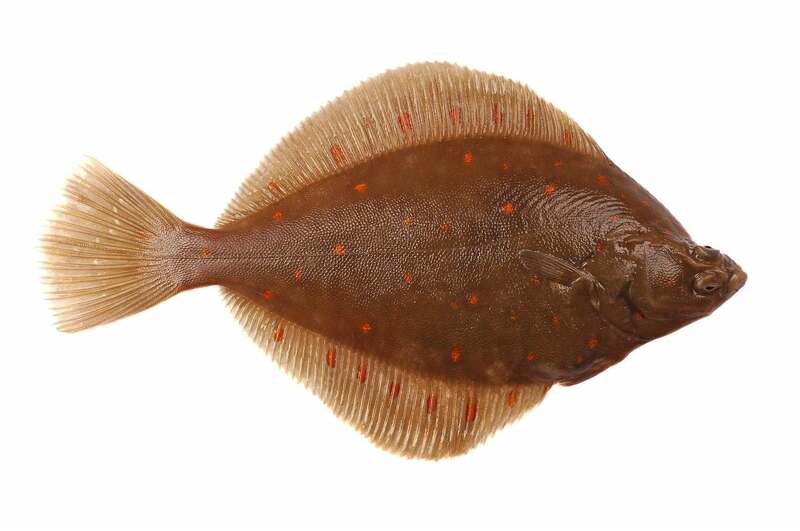 Like other flatfish, plaice are mainly caught by beam trawling, which involves dragging a metal beam along the sea bed. The beam has skids or wheels at either end to hold it just above the sea bed. The approach of the beam disturbs the fish lying ahead which rise off the sea bed and are caught in the net behind the beam. Beam trawling has a bad reputation for damaging the sea bed and catching large quantities of unwanted species. However, the technique has been used for decades in the North Sea plaice fishing areas whilst catches and stocks have – after a scare 15 years ago - remained healthy. 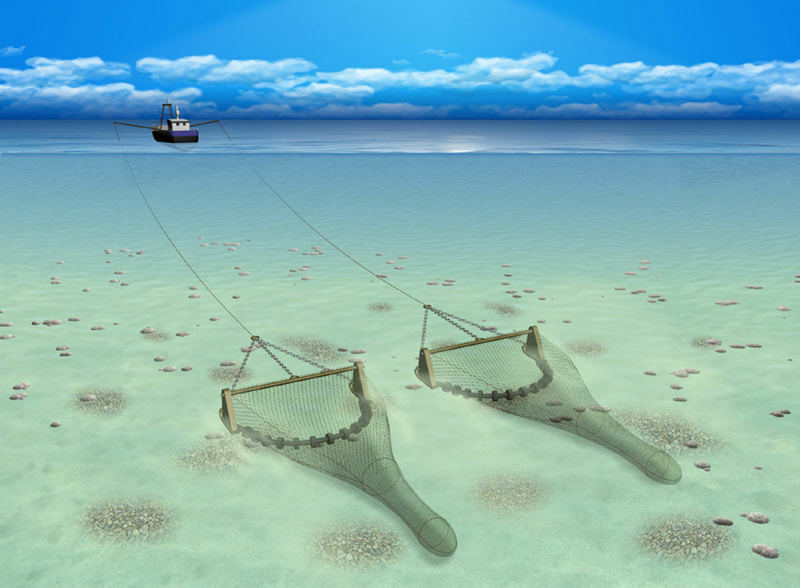 Beam trawling however is banned along the coast from Northern France to the tip of Denmark, where most young plaice are found. Plaice cohabits with Dover sole and the fishing targets both. Dover sole is a valuable fish, much more so per weight than plaice, but it is also smaller. The net mesh size of 80 to 100 mm is set to capture the Dover sole, with the inescapable consequence that many too-small and immature plaice are caught. Historically, often half and sometimes more than half of all the plaice caught was under-sized and therefore discarded. This is known as the “unwanted catch” and its high level was presumably a key factor in the steady reduction of plaice landings after the mid-1980s. The “wanted catch” fell from 180,000 tonnes in 1986 to 60,000 tonnes in 2007. At this point the EU began to implement a sustainability regime, which has reversed the trend. The wanted catch exceeded 80,000 tonnes in most years since 2012 and the unwanted catch as a percentage of the wanted has fallen, in 2016 and 2017 standing at a third of all plaice caught. Plaice stocks are considered good. The Marine Conservation Society acknowledges this stock status but rates most North Sea plaice as “probably should not be considered sustainable”. In 2006, the WWF issued a very report about plaice fishing. This is still widely quoted 12 years later, whereas it would seem to be out of date. Similarly, Greenpeace redlisted plaice in 2010 and has never updated its advice. Holland dominates plaice fishing, catching around 45% of the total North Sea landings. The UK catch is about half this figure. Almost all The Fish Society’s plaice fillets are from a single high quality processor in Holland.